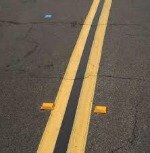 Technically they’re known as Permanent Roadway Pavement Markers (PRPMs). They’ve not only been used “for years” at “specific” highway locations, said transport ministry spokesman Bob Nichols. But the province has “experimented with and done extensive evaluations” on them for many years. PRPMs come in several different types. The “most effective” are so-called “recessed” reflectors installed in a slot cut into the pavement. These include bridge approaches, lane transitions and curves. Here are some other area earmarked for cat’s eyes. * those with operational deficiencies and construction is scheduled beyond a three-year period. * where there is higher than provincial average of collisions for similar facilities and “clear evidence” vehicles are running off the road or straying from the lane. * areas where nighttime visibility needs to be enhanced – i.e., areas prone to inclement weather. * areas with unexpected lane drops. * approaches to narrow bridges or other obstructions.